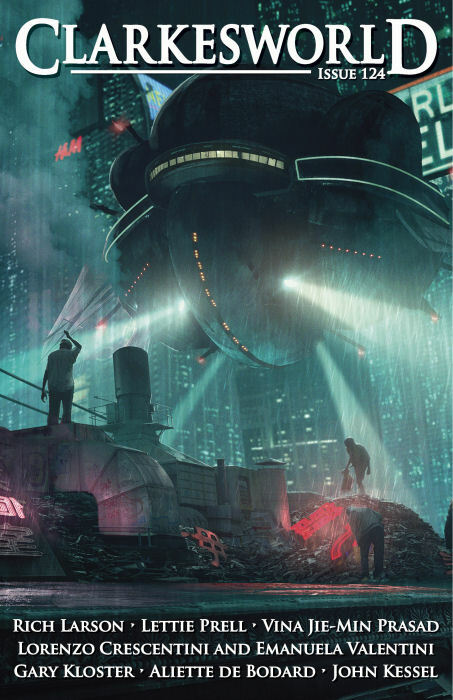 "The Ghost Ship Anastasia," by Rich Larson [bio] (edited by Neil Clarke), appeared in Clarkesworld issue 124, published on January 1, 2017. Pro: There’s plenty of action and adventure in this story, and it even has a happy ending. .
Con: Silas is a terrible protagonist, of the "too stupid to live" variety. When the AI threatens the team and he grabs the howler and runs off to try to save his sister's ghost, leaving his shipmates in the lurch, the story jumps the shark. The science is painfully bad, dumping the reader out of the story over and over again. A micrometeorite capable of punching through the ship’s hull is going to cause major damage—not go undetected. The technobabble is terrible, especially any of it that involves computer software. The fragile mind upload technology that can be copied into a spacesuit but deteriorates quickly is hard to believe—it appears to exist solely to create urgency for the story. wow has your reviewer never heard of Coleridge's suspension of disbelief? The story was powerful and completely credible in the telling. That's a matter of opinion, though. To succeed, a story needs to earn the reader's willing suspension of disbelief, but it can only ask for that at the beginning. When a story needs more suspension of disbelief in the middle, it pops the reader out of the story for a moment, even if he/she goes along with it. If it does that a lot, it fails. Sometimes if the characters and the plot are very compelling, it's easier to overlook things in the environment. But in this story, the characters and plot were also hard to believe. The messed up science didn't bother me as much as the selfish, dis-likable protagonist and the squicky horror. In the end I thought the story was okay though -- maybe the fast pace just got me through it.